In the world of cycling the biggest race of them all is the Tour de France. The prestige, popularity and history of the race make it the penultimate cycling event for cycling fans and professional racers alike. The race has stood the test of time and is quite possibly the hardest sporting event in the world considering it lasts three weeks, forces the riders to race for up to seven hours a day, and covers some of the highest roads in Europe. The Amgen Tour of California can’t compare in terms of legendary status, and with only eight days of racing the California tour is roughly only one-third the length of the Tour de France. However, the recent 2010 edition had many riders and team staff members saying it was too hard. In fact if you look at the results for just the sixth stage between Palmdale and Big Bear Lake (7,000ft above sea level) eleven riders didn’t make it to the finish line within the 9% cutoff time, and 17 starters simply decided to drop out. That makes 28 riders who never made it to the start of the stage 7 time trial in Los Angeles. Less than half (63) of the 128 starters actually officially finished the entire Tour of California. Ok so the Big Bear day was hard, but how hard was the Tour of California to finish? Was America’s most prestigious event simply too hard and if it continues to be as demanding will it be to the detriment of the event moving forward? It is hard to argue with an experienced rider such as Julich who himself has finished on the podium in the Tour de France. In an attempt to add some objective data to Julich’s opinion we might find some answers by simply comparing and contrasting the eight hardest consecutive stages of the 2009 Tour de France with power files collected from this year’s Amgen Tour of California. And the winner is the Tour de France at an 8-day total accumulated value of 31,479kj and an average of nearly 4,000kj a day. The Tour of California is just behind with a daily average of just over 3,500kj a day. *Fuglsang- Stage 8 is not available so we can assume it was around 3,000 based on Darren Lill’s power file and the two finished in the same group together tied for 40th place 15’ down. The 2010 Amgen Tour of California’s winner, Michael Rogers, completed the race in 33hrs and 8 minutes, as compared to 33hrs and 3 minutes for the accumulated finish times for stages 2-9 for the 2009 Tour de France winner Alberto Contador. There is no clear winner within this category. The times are almost exactly the same. TSS® is a very valuable metric to track since it takes into account the intensity of the race as compared to the individuals own functional threshold power value. 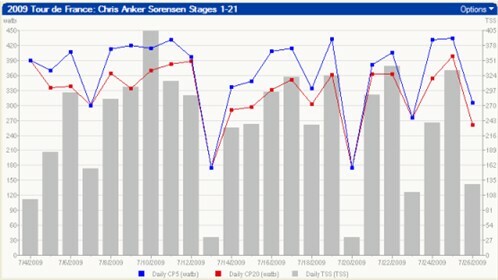 Besides an Intensity Factor® being accounted for, the TSS value also takes into account the duration of the race. This has much more meaning than kilojoules since kilojoules do not account for the relative intensity of a race. What might be a threshold pace for one rider may be a lower tempo type zone for another, yet if the two riders weigh the same, and recorded exactly the same watts, the KJ’s would also be the same. Yet again another toss-up here. Fuglsang recorded an enormous 431TSS points since he was in the long breakaway group. In contrast Sorensen measured 391TSS points within stage 7 of the ’09 Tour de France. Fuglsang would have had a lower value if he hadn’t been off the front for so long. It seems as if the hardest days in the grand tours measure around 400TSS points. The Tour of California had a slight advantage when you compare the total accumulated TSS values of the two riders in the Tour of California versus Sorenson’s highest eight-day accumulated value from the Tour de France. Now of course it goes without saying that the Tour de France as a whole is harder since it is three weeks long, but now we can see how the Tour of California is just as difficult as the hardest week of the Tour de France. The US domestic teams certainly deserve a lot of credit for any amount of success they find at the Amgen Tour of California. The race has evolved to a level where the European-based riders can’t simply show up with sub-par fitness. Just finishing the Tour of California now pushes each rider to the limit and keeps pretenders away. Whether this is good or not for the future of the Amgen Tour of California is yet to be seen. One thing that is certain is if the race continues to be as hard as this year’s edition some of the bigger names in the sport may opt to skip the Tour of California as their classic’s season ends. Dirk Friel is the co-founder of TrainingPeaks, former professional cyclist and USA Cycling coach. As the President of Peaksware and Chief and GM of Fitness Brands at TrainingPeaks, Dirk has helped Tour de France teams, Olympians, World Champions and age group athletes to use TrainingPeaks tracking, analysis and planning tools to optimize their training for 20 years. Follow him on Twitter @dirkfriel.